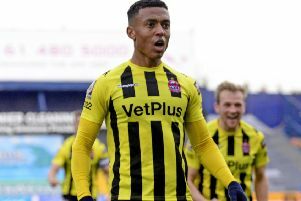 The Coasters produced a thrilling 3-2 win at Stockport County on Saturday to earn a spot in the final of the FA Trophy. There they will come up against Orient, a side they also face at Brisbane Road tonight in an encounter that could go a long way to deciding where both sides finish in the National League come the end of the season. The O’s currently lead the way but Fylde, who are just six points adrift in fifth, know a win will put them right into the title mix. Challinor, speaking after the weekend’s semi-final second leg triumph, said: “I’m not going to look too far ahead and think about what might happen in the game at Wembley when it comes around. Our focus has to be on Tuesday. “It’s a quick turnaround. We’ll travel on Monday and we’ll train on the way down. It’s likely we’ll make some changes so we’ll have to do a bit of work on Monday. “I’ll enjoy this, I’ll have a beer for all of them, but they’ve got to be professional and they’ve got to do things right. “We’ll have an opportunity at the end of the season to celebrate what will hopefully be more success. A proud and emotional Challinor said the way his side performed at Edgeley Park on Saturday is exactly the way he wants the Coasters to play week in, week out. He added: “Of course we can put it to the back of our minds, we’ve shown we can do that going through the season to date. “It’s something we can focus on when it comes around. Regardless of what happens between now and the end of the season, the players have got an opportunity to showcase their talents at the greatest stadium in the world. “You have to look forward to that, you’d be daft not to, but what you do have to remember is the emotions and the feelings because ultimately that comes from being successful. “You have to remember what got us that success. The variables we can control, winning is a consequence of that. “Even if we had lost at Stockport, after that performance, I can’t be critical because we were fantastic. “We played in a style I want us to play, we made a very good team work really hard out of possession and gave them very little opportunity with the ball because of how well we looked after it. “We deserved our win, I don’t think anyone who was here can say otherwise. We put on a performance and we now have something to look forward to. “I thought we were fantastic and we dominated the game territorially. “We gave a sloppy goal away but they started as you would expect them to with a massive crowd behind them. “They put us under pressure and we had 10 men for the first five minutes because Jordan Tunnicliffe was off with a broken nose. “We had to weather a bit of a storm but once the game settled down we were comfortable and we controlled the game. “At half-time it was about instilling the need for patience and for more of the same. We get an equaliser after having them penned in for the whole of the second half, get ourselves in front and with five minutes to go you think ‘this is it really’. 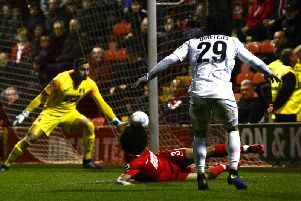 “We concede another poor goal from a set piece from what was their only real attack in the second half, but after that disappointment we showed an unbelievable amount of character to go and get the winner.